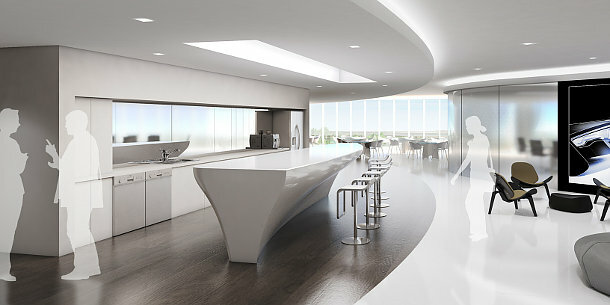 An interior render created by Gensler using V-Ray for SketchUp. Version 1.6 adds features that will be familiar to users of the 3ds Max and Maya editions of the software, including the V-Ray RT preview renderer. Chaos Group has unveiled V-Ray 1.6 for SketchUp: a significant update to the SketchUp edition of the render engine that adds a lot of features that users of the 3ds Max and Maya versions will already be familiar with. Those features include interactive preview renderer V-Ray RT and the V-Ray Proxy system for managing complex scenes more efficiently, while V-Ray’s Dome and Sphere lights are also now available within SketchUp. Version 1.6 is currently available as a free open beta. Chaos Group expects the beta to last for around three months, with the commercial release in August, at which point the price will go back up to its usual $800. The open beta is available for SketchUp 8 and SketchUp 8 Pro on Windows and OS X. It’s 32-bit only. Artists, architects and designers always want their software to do more. More detail, more speed, more quality. Today, with the announcement of Chaos Group’s V-Ray 1.6 for SketchUp open beta, these users now have the biggest expansion to SketchUp’s rendering capabilities right at their finger tips. This massive upgrade to V-Ray for SketchUp includes a series of new feature introductions that enhance visualization workflow and render quality (V-Ray RT®, V-Ray Dome Light) and streamline scene complexity (V-Ray Proxy). As part of this update, V-Ray 1.6 for SketchUp will offer architects and designers access to proven V-Ray technologies that accelerate the creative process. For example, with V-Ray Proxies users can now achieve exceptionally high levels of detail and modeling complexity while efficiently rendering massive amounts of geometry in the blink of an eye. Proxies can also be shared between V-Ray versions giving architects the ability to share models between 3ds Max, Maya, Softimage and Rhino. This CPU-supported rendering engine streamlines scene setup and provides instant visual feedback directly in SketchUp for quicker design, material, and lighting decisions. Creates simple, artifact-free image-based lighting using importance sampling of HDR images. This technique greatly optimizes light tracing and GI precision. V-Ray lights can now be part of a SketchUp component, making the process of changing the design and settings of multiple lights at once much easier. Creates spherically shaped area lights. Manages scene memory and efficiently renders large amounts of geometry to increase detail and complexity in scenes. V-Ray Proxy objects are dynamically loaded and unloaded at render time, which saves vital RAM resources. Chaos Group is also releasing a set of materials that will help their users experience the benefits of V-Ray 1.6 for SketchUp even faster. Those materials include: help documentation, a dedicated beta forum, tutorials, and videos explaining the new features. The free open beta of V-Ray 1.6 for SketchUp is available for SketchUp 8 on both the Windows and OS X platforms – 32bit only. It can be downloaded right now by applying for the public beta program on Chaos Group’s website. Pricing for V-Ray 1.6 for SketchUp will remain unchanged ($800). The upgrade price from V-Ray 1.49 for SketchUp or lower is $320. Users who purchased V-Ray for SketchUp between April 15, 2013 and the official release date will be eligible for a free upgrade.